I started watching Doctor Who years ago, and fell in love with it. There is something so fascinating about time-travel, and all of its rules and regulations that makes the hit British sc-fi series so appealing. We get to see the future and different planets more than we get to see The Doctor and his companions travel to the past. And the truth is that over the years, television has replaced one fad with another. This year, that fad seems to be shows about time-travel. Shows about traveling through time aren't really new (as I noted above, Doctor Who has been around for over 50 years and has covered this subject), but they seem to be all the rage this season, replacing the now-tired zombie show fad. When you can flip through the major cable networks and see shows like Time After Time, Legends of Tomorrow, Frequency, and Making History, it might seem difficult and overwhelming to choose a time-travel show that checks all of the important boxes (mystery, rules to messing with time, consequences for breaking aforementioned rules, character development, etc. 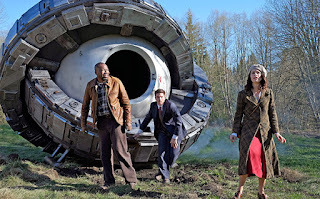 ), but while I was initially skeptical of NBC's newest addition to the time-travel genre, Timeless, I found myself completely compelled by the pilot. Perhaps my apathy regarding the show came from the over-promotion of it at Comic-Con this past year, where you couldn't walk ten feet without seeing a shuttle bus or billboard for the series. And because the show's debut conflicted with Conviction (a pilot I had screened for ABC and wanted to live-tweet), I brushed the show aside. Fast-forward a few days to me waiting out a hurricane with nothing but my laptop and new pilots to keep me company. And while Timeless isn't revolutionary, necessarily (it provides the same kind of drama you would expect from an NBC series), it is a perfect encapsulation of what a time-travel genre show should be about, hitting all of the right notes and giving viewers a refreshing twist on an already-tired genre. The show is about a woman named Lucy (Rectify and Suits' Abigail Spencer), a history professor whose mother (played by Arrow's Susanna Thompson) built the department she works in from the ground up and is widely known and respected. Unfortunately, Lucy's mother is dying and there's nothing she can do to prevent that from happening. So it surprises Lucy when she gets a call from the government, requesting her presence at a lab where — apparently — a time machine has just been stolen. After the initial shock and denial wears off, Lucy, together with a soldier named Wyatt (Matt Lanter) and a coder named Rufus (Malcolm Barrett) take off for the 1930s in order to stop the terrorist who stole the machine from enacting his plot. On the surface, this might seem like a pretty normalized concept for a time-travel show: a criminal does bad stuff and a team has to chase him through time to stop him from doing more bad stuff. I mean, it's essentially Legends of Tomorrow without the superhero costumes. But what I appreciate about Timeless is that it knows in order to be great, it needs to be about more than just time-travel shenanigans. So Timeless establishes hard and fast rules: you cannot go back to a time in which you already have existed. So the team presumably can't travel back to the 1980s or 1990s, because they've already been born. Rufus explains this early on to Wyatt and Lucy — you can't risk crossing paths with your former self in any way; it'll disrupt time and space itself. What's more, you can't travel back to a time you've already been to. At the end of the episode, Wyatt wants to go back and redo what went wrong in the 1930s, but Rufus points out that they can't — they've already been to the 1937. They can't encounter themselves again. I love this rule, because it means that the show can't bend or break logic in order to tell its story. Shows about time-travel that have rules to them are so vitally important. 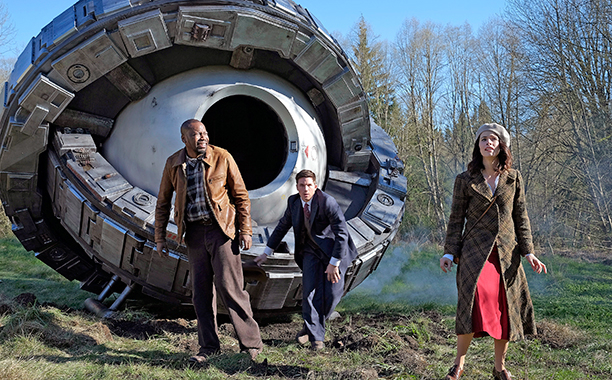 The final piece of the successful puzzle for Timeless is providing a vague-yet-convincing overarching mystery. Our villain, Garcia (Goran Višnjić), is traveling through time to wreak havoc, but we don't quite know why yet. When Lucy confronts him, he reveals something to her — a journal filled with things apparently written by her. The only issue? She hasn't actually written them yet. Whew, time-travel, right? What is very interesting is that already Garcia has planted seeds of doubt in Lucy's brain and tells her to ask the government about a specific word and why they chose her, of all people, for this mission. Lucy doesn't receive any answers from the government, which makes her — and us, too — suspect that there might be more to this whole time-travel espionage business than meets the eye. I'm excited to see how this particular plot unravels throughout the season, because it has a lot of potential for intrigue and good character development. Timeless is already off to an incredible start. There is enough humor within the drama to make the show relatable and interesting, enough character development and cast chemistry to make these relationships plausible, and enough mystery to make the show interesting and long-lasting. I'm hopeful that as the characters travel through time, we will learn more about them, more about our mysterious villain, and more about history itself.